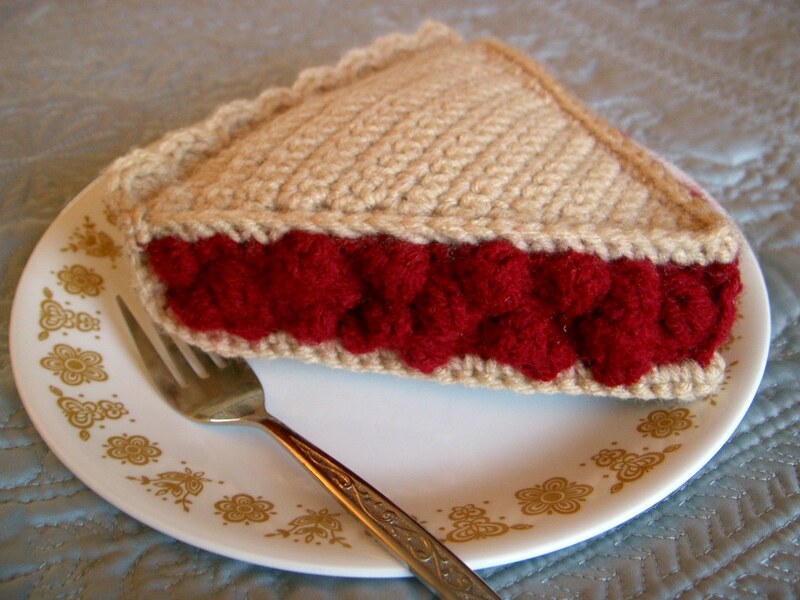 Here is a free pattern for my crochet cherry pie, as entered in the ongoing food challenge. Please make as many pies as you can! If you do make some, I would love to see them posted here. But please do not use the pattern or completed pies for profit. Thanks! Row 2: Make 2 sc into 1st ch (2 sc total). Ch 1. Row 3: Make 2 sc into each sc (4 sc total). Ch 1. Row 4: sc across (4 sc total). Ch 1. Row 5: Make 2 sc into 1st sc, sc into each of next 2 sc, make 2 sc into last sc (6 sc total). Ch 1. Row 6: sc across (6 sc total). Ch 1. Row 7: Make 2 sc into 1st sc, sc across until last sc, make 2 sc into last sc (8 sc total). Ch 1. Row 8: sc across (8 sc total). Ch 1. Row 9: Make 2 sc into 1st sc, sc across until last sc, make 2 sc into last sc (10 sc total). Ch 1. Row 10: sc across (10 sc total). Ch 1. Row 11: Make 2 sc into 1st sc, sc across until last sc, make 2 sc into last sc (12 sc total). Ch 1. Row 12: sc across (12 sc total). Ch 1. Row 13: Make 2 sc into 1st sc, sc across until last sc, make 2 sc into last sc (14 sc total). Ch 1. Row 14: sc across (14 sc total). Ch 1. Row 15: Make 2 sc into 1st sc, sc across until last sc, make 2 sc into last sc (16 sc total). Ch 1. Row 16: sc across (16 sc total). Ch 1. Row 17: Make 2 sc into 1st sc, sc across until last sc, make 2 sc into last sc (18 sc total). Ch 1. Row 18: sc across (18 sc total). Ch 1. Row 19: Make 2 sc into 1st sc, sc across until last sc, make 2 sc into last sc (20 sc total). Ch 1. Row 20: sc across (20 sc total). Ch 1. Row 21: Make 2 sc into 1st sc, sc across until last sc, make 2 sc into last sc (22 sc total). Ch 1. Row 22: sc across (22 sc total). Ch 1. Row 23: Make 2 sc into 1st sc, sc across until last sc, make 2 sc into last sc (24 sc total). Ch 1. Row 24: sc across (24 sc total). Ch 1. Row 25: sc across, but into back loop only (24 sc total). Ch 1. Row 26-29: sc across (in both loops again) (24 sc total). Ch 1. Row 30: *Make 3 dc into 1 sc, then sc into next 2 sc*. Repeat * across. Cut yarn. Repeat Row 1-25 to make top crust. Cut yarn. Row 2-5: sc across (24 sc total). However, every so often, instead of making a sc, make a bobble by making 5 dc in one stitch, but leaving the last loop of each dc on the hook and then drawing through all remaining loops at the end. Make bobbles random, make sure to make little clumps of them to look like the cherries are bursting out. Pop the ones on the "wrong side" out to the correct side. Assemble the pie together and stuff firmly. Make sure you stuff the bobbles! I whipstiched the filling to the crust, then finished the piece by sc around the crust (make sc through both the crust yarn and filling yarn). This hides the whipstiching and also makes a slight overhanging lip of crust so that the filling doesn't bulge past it. That's it! Enjoy your pie. You can make many different flavours, too. Blueberry would be cool. Please post your finished pies! That's super cool, and I totally have those plates. Anything I've posted here can be remade for commission and some for swap. PM me with any questions or requests. Looks good enough to eat!! (I LOVE cherry pie!!) Thanks for sharing, as soon as I make a few other (million) things, this is next! Thanks for sharing this pattern! It looks good enough to eat! It looks nice and easy, too. And thanks for the suggestion to make a blueberry pie- one of my friends LOVES blueberry pie and blueberries, and I could tuck one into a blueberry-themed gift for him. What he'd do with it, I don't know, but it's the thought that counts, right? I love this! I voted for your entry in the crochet challenge! Love the tarts too. The lemon meringue pie was my favorite! It was PERFECT!! Crocheting is like prostitution. First you do it for love, and then for a few close friends, and then for money. Maybe that is why they call us Hookers? Aw, thanks I appreciate your votes and compliments! The lemon meringue pattern is on the way. It's very similar to the cherry pie, but with bobbles on the top. Hope to see all sorts of pies posted soon. YAY. Thanks for your genorousity for sharing these incredible patterns. I, too, voted for you. Thank you, thank you, thank you!